Lately it seems that many people I know have been lacking in energy, struggling to sleep, and so forth. It’s a draining time of year, so I think the Fire Dragon is here to remind us to do what it takes to maintain our energy. Maybe get back to a short daily walk or yoga session, avoid the crappy food that is so abundant at this time, or whatever helps you. This card shows the flaming Dragon of King Uther’s vision. In the distance we see Glastonbury Tor. Legend tells of a secret cave with in the Tor, used perhaps for initiation. Flaming Dragons often guard such caverns to prevent their desecration by the greedy and to offer their treasure to those who are worthy. In the foreground, laying on the rock, is a golden torc – Celtic neck ring indicating high status, rulership, and mastery. Meaning: Fire dragon brings vitality, enthusiasm, encourage, and an increased ability to overcome obstacles and to find the energy needed to cope with life‘s problems. Having the powerful fire dragon as an ally will align you with the qualities of leadership and mastery. With care, he will fuel your inner fire which can be directed and channeled with laser-like precision to help you accomplish tasks and achieve objectives. This card can also mean that you may be repressing a good deal of anger. This may make you feel that you are not in control of your life energy. Either you experience energy as out of control – erupting without warning or constantly bubbling near the surface – or you may sense it has scattered or dissipated. Are you often lacking in energy and vitality? Do you find it hard to get excited or motivated? Or do you find you have too much nervous energy, making you over excited, unable to sleep, concentrate, or relax? 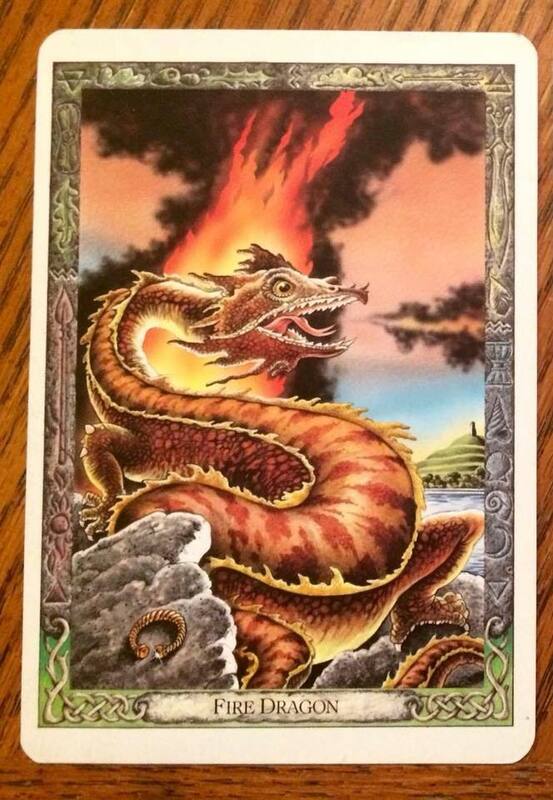 Whether you have too much or too little energy, developing a harmonious relationship with the fire dragon will help you. If you were lacking in energy, you may need to ask the dragon to give you a little more of the treasure he is guarding. If you find your energy level is too high, you may need to do the reverse – to ask the dragon to take charge of some of your energy, guarding it fiercely, sure in the knowledge that you will be given access when you really need it.